Sekiro Mod Engine Easiest way to do game file replacement, which this mod requires. 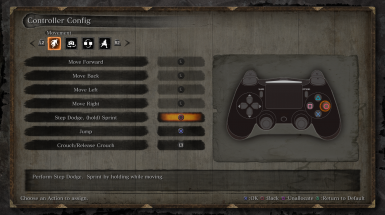 Turns out Sekiro has assets for PS4 buttons/menus but it wasn't activated in the final release. This mod modifies the UI layout files to restore them. 1. Install mod engine (https://www.nexusmods.com/sekiro/mods/6). This is needed to modify Sekiro game files. 2. Extract the zip file and copy the "menu" directory to Sekiro\mods (or your mod directory if you create a custom one in modengine.ini). 3. You have PS4 menus now. 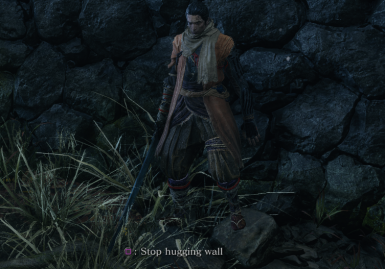 Note: This mod was built and tested on Sekiro app version 1.02 Steam edition. Cracked versions are not tested and will not be supported. Future steam Sekiro versions may work, but I will update if they don't. 1. Try the latest version of mod engine. I've made updates to it to try and make it more compatible with potentially different exe versions. 2. Make sure you create a directory called "mods" in the Sekiro directory. Make sure it has no "\" or "/". See the mod engine image for what this may look like. 3. "menu" should be copied directly inside "mods". Not the parent directory "PS4Buttons". If your menus are missing or look weird, update to mod engine 0.1.9. This should fix the issue (for real this time). If this still doesn't fix your issue, try copy pasting mods\menu to the Sekiro directory so that you have both Sekiro\mods\menu and Sekiro\menu. Let me know in the comments that Mod Engine 0.1.9 still doesn't work.